It’s okay; I’m not a professional. – These Two Eyes! It’s okay; I’m not a professional. One would say a professional blogger may comment on such things about 99% of the population and what it truly means to share the wealth, or perhaps the probability of it snowing in New York unexpectedly this past Halloween, or the odds of having floods again in Queensland this summer. The interesting thing is, I’m not a professional blogger. Yup, a massive surprise to us all. In no way do I have intentions to undermine any of the above controversial global issues nor contribute an educated opinion without supporting the facts (which I’m aware doesn’t require professional blogging skills) but I’m just here this time around to talk about a few simple things in life: Byron Bay and the hippies, Surfers Paradise and the tanned guerillas, and the quality of the XXXX brewery tour to outshine any of its beer worthiness. I would assume a best practice in blogging may be to assume one subject area and objectively present your opinion. I like to combine all subjects that I experience over a week or two period of time and overwhelm my readership with an explosion of thoughts. About a 2 hour drive south of Brisbane, crossing over the Queensland border into the state of New South Wales, sits Byron Bay. It’s known for its laid back atmosphere, a carefree paradise where hippies sit around bonfires in the evening strumming their guitars amongst the plethora of backpackers that flock to this coastal town. 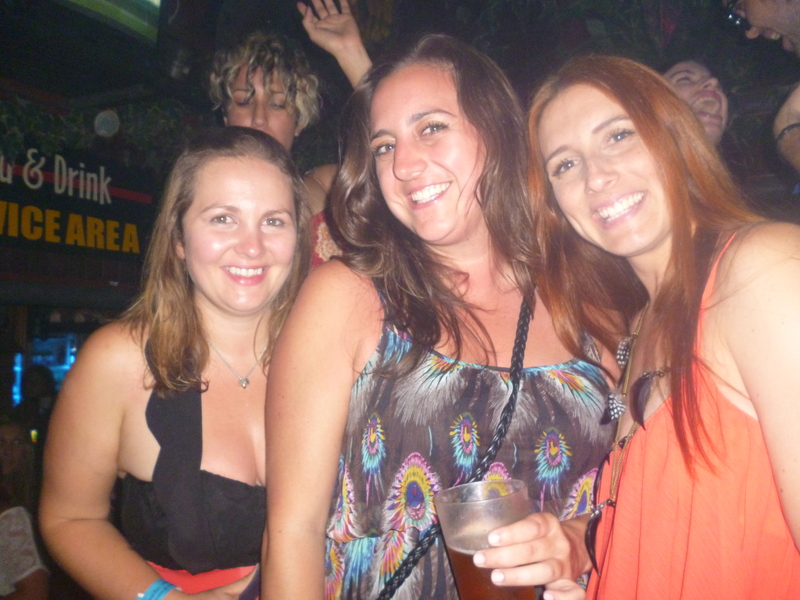 There are strips of local beach shops mixed amongst high street retailers, stalls selling fish tacos and wheatgrass shakes mixed in between a thriving nightlife. 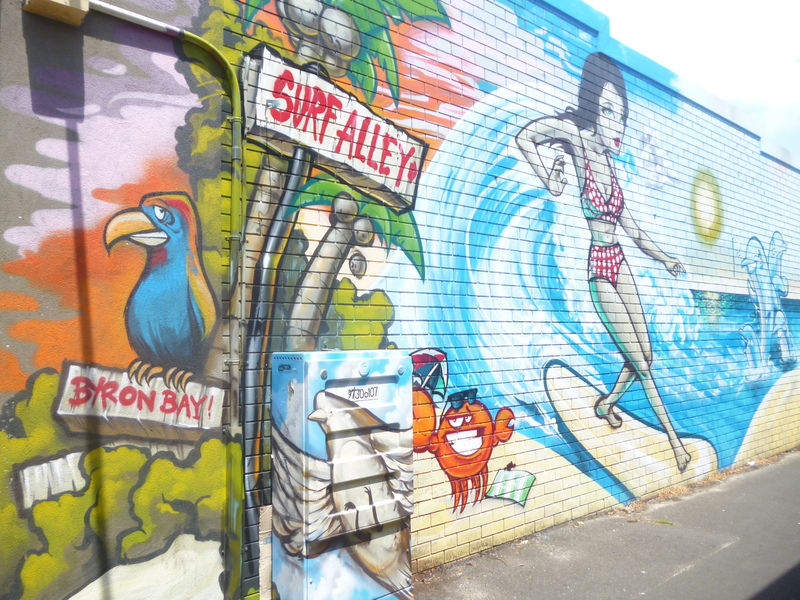 A weekend getaway found me approaching this beach town passing the surf shops and tanned and toned surfers walking the highway with board in tow giving me a sense of the Australia that foreigner’s picture in their heads. The relaxed, artsy hostels packed with locals and travelers alike make this a prime stop off for most backpackers traveling along the east coast. We were just here however to celebrate a birthday. 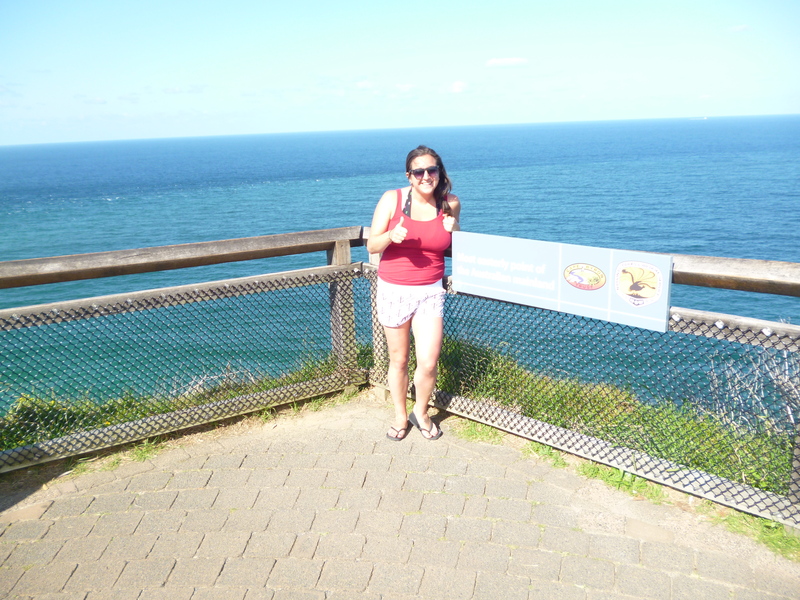 After late night shenanigans at notorious, trashy and divey Cheeky Monkey’s we spent the following morning letting the rays soak up our hangovers before heading to the Cape Byron Lighthouse that marks the most easterly point in Australia. 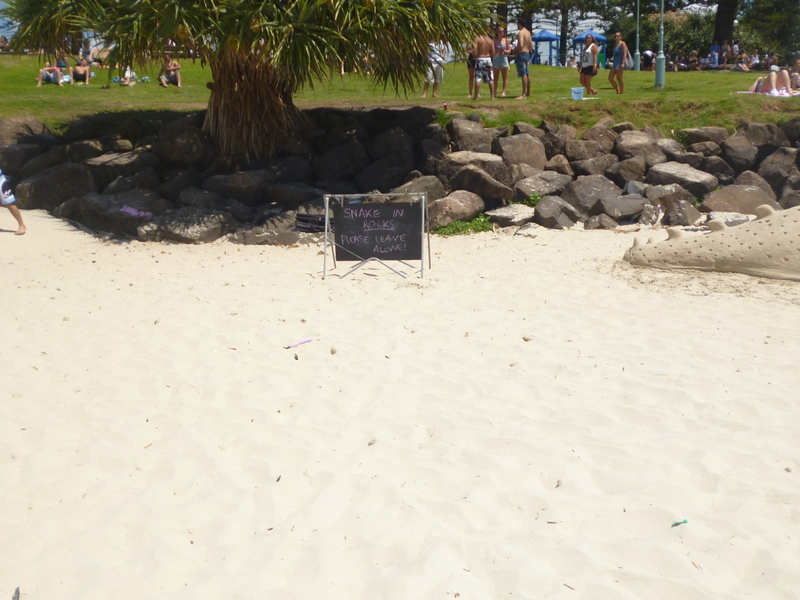 Also noted that whilst tanning on the beach the lifeguards simply put up a sign near the rocks that hug the walking path (aka sidewalk), bathrooms, and road with “Snake in the grass. Please leave alone.” Let’s hope that was a friendly, cuddling sort of snake, not one of the world’s deadliest that live in these parts. So that brings me to the following weekend, pre-Halloween weekend. A bit depressing that this would have marked the 6th year of Emily and Lisa’s Halloween extravaganza where we rent a bar in Manhattan, give away $$$ worth of prizes and provide our friends with a place to get down and scary. 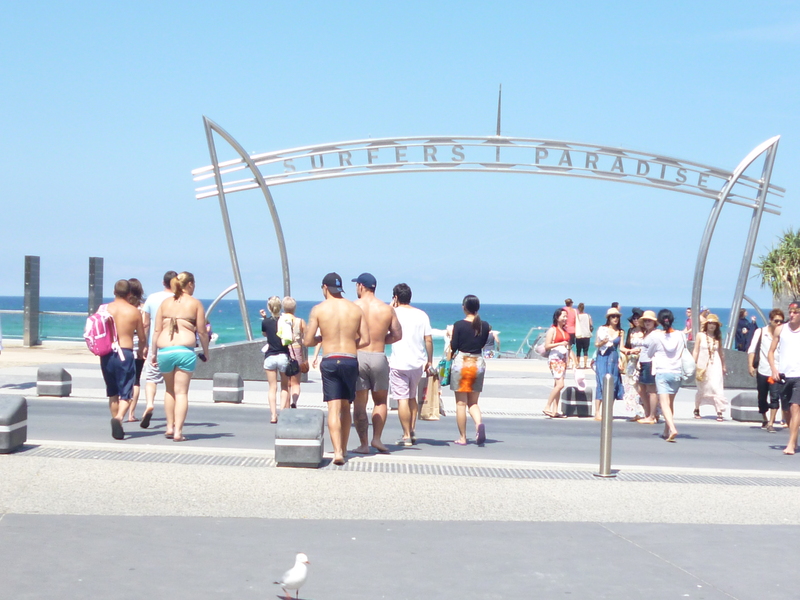 Alas, I hopped on a train, down the coast again, for my first trip to Surfer’s Paradise. Surfer’s is a place that many a traveler to Australia puts on their agenda. But reality check! 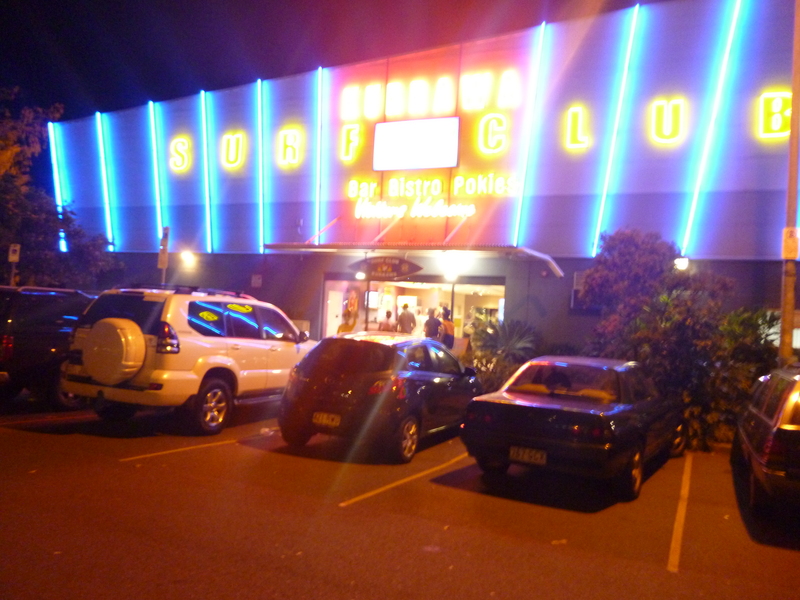 Surfer’s is a touristy, high-rise filled Gold Coast destination, complete with tanned guerilla men, meter maid fairies in Leia-like bikinis and clubs pumping with mega techno beats. Think Jersey Shore people. And not the Jersey Shore I grew up with as my home away from home. Halloween of oh-eleven came about a bit like this…I was way “over” my Oktoberfest costume that showed up the Monday after the event, that I refused to wear it and instead am hoping to score some bucks on eBay and therefore roamed the streets of Brisbane searching for a fun, scary, and cute Halloween costume. Guess what though? There are no Halloween costumes in ALL of Brisbane! Target, Kmart, Big W, chemist shops, malls…NOTHING! My best bet would be hiring (aka renting) a costume for about $70 bucks a pop at a costume store which was not an option so I got some office supplies, made some leopard (note Leopard, not cat) ears and ended up with some girlie affair of a costume. *By stating “I”made what I meant is asked some creative colleague types to make on my behalf. 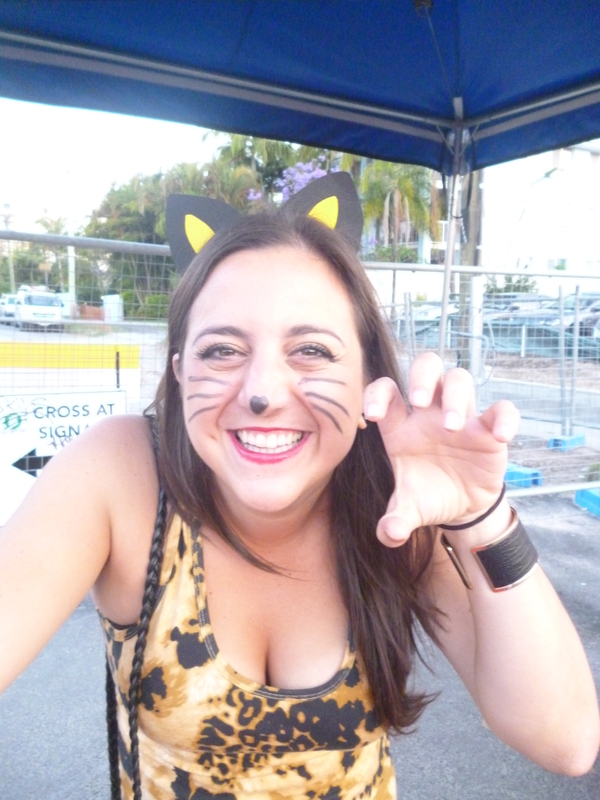 I'm a freaking Leopard okay, not a CAT! 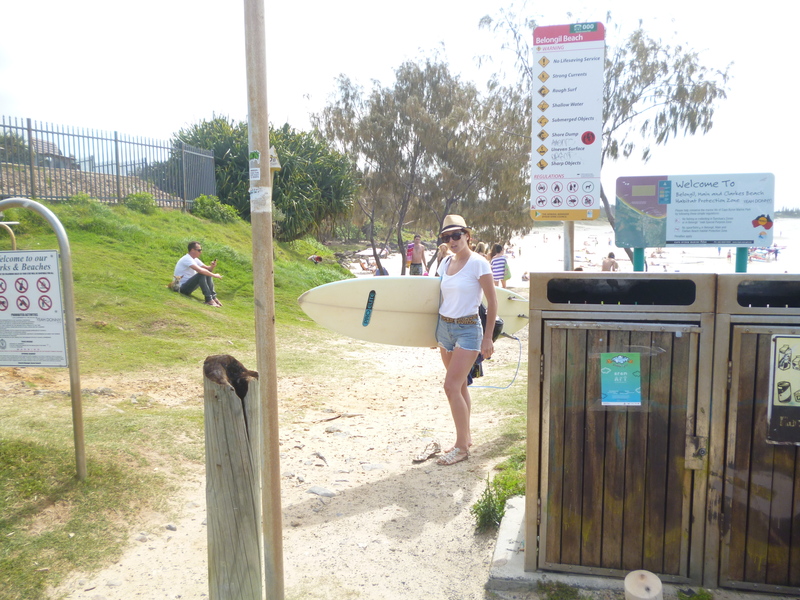 We went Surf Club hopping – from Broad Beach (less trashy, more classy) North to Surfers stopping off at the Surf Clubs for some brews. Surf Clubs perhaps could be comparable to US golf club houses, but not quite the class – you pay a fee to access food, bar and premium real estate. Very good fun. 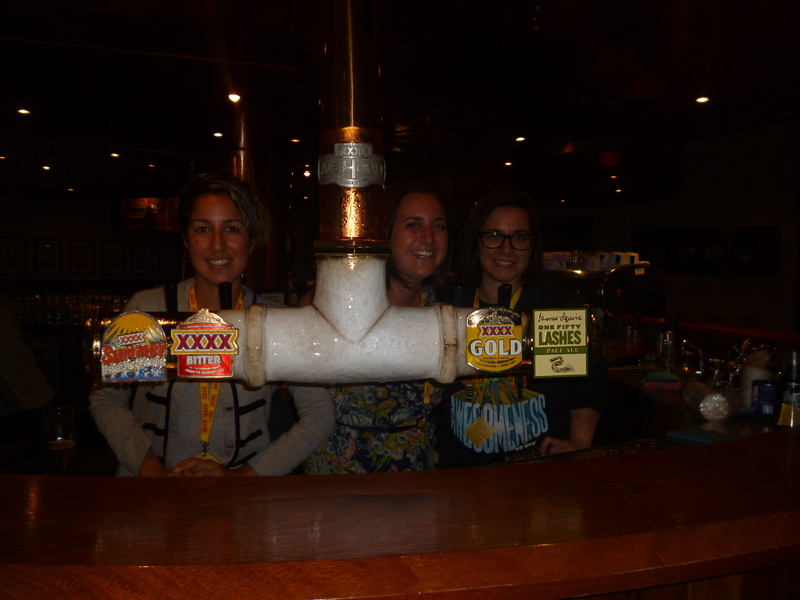 And so I have to give a proper shout out to one of my best besties Emily who prior to me arriving in Brissy gave me the sweet present of a gift voucher to the XXXX brewery. XXXX is a Queensland icon. A crisp, unflavorful beer drunk by the Queenslandish Queenslanders in a way that Nascar drivers drink Coors Lite. Get it, right? But from beer appreciator to beer appreciator I couldn’t have asked for a more inspiring gift. It took months to recruit some local friends to join me on this beer journey; many of them grew up in Brisbane and have worked for years at Wiley, where the lights of the brewery shine up from the view from our office cubicles, however mission accomplished. The $38 dollars to fork over was hard to justify but my dear mates Nidya and Anna were in and on we marched up the hill to the brewery on a warm Spring Wednesday evening. Impressive! I recommend to any friend or family member who will pay $2000 to fly over to hang with me! Funny, old school adverts showcasing authentic Aussie males sipping their XXXX in the bush being men of men with strong backwoods accents; bring in a hopping kangaroo and they couldn’t have been more picturesque Australian. With corny tour operator leading the pack, this journey took us through the history of this beer to the bottling process where we watched factory workers attempting to stop bottles from slamming into each other before breaking on the factory floor. Hilarious for us spectators. I learned things such as the Aussie term “sculling” aka chugging, is derived from the Vikings who would decapitate their enemy then drink beer out of their skull, as well as the urban myth of authentic Aussie spread Vegemite being derived from leftover beer yeast. When on the factory floor I dared Anna to ask about how many workers have had their arm sliced off in the machinery; I don’t believe our guide when she said no one recently. At the end of the tour we got 4 beers – pronounced “be-ya’s” which weren’t small, in addition to a bbq feast. We envisioned some sausages and light salad but what we got were full course meals of sausage, ribs, salad, cous cous, potato salad, and a roll. Big hit! Plus, becoming bff’s with tour guides Jessica and Paul, who let us pour our own beers behind the bar, and took photos with us. We walked away after taking off our bright orange safety vests and protection goggles with a souvenir of a XXXX lanyard and memories to last a lifetime. They gave us no choice as they were professional talkers. Or whatever. They also brew things like the delicous James Squire imprint which tainted me with their dark, delicious Porter. Mmmm yummy stouts! Spaghetti. I grew up calling spaghetti, spaghetti. Not spaghetti and meatballs, regardless if that’s what it contained, just spaghetti. In the UK, as well as here in Australia, you would specify more so as spaghetti Bolognese. Or as the Aussies do, just call it Spag Bole. Secondly, summer storms. It’s still not summer, but already the storms are coming. The hard, fast rain pounding on the pavement, the lightening lighting up the sky, my face under the pillow, it’s all a taste of what’s to come. I’m scared. And lastly, toilets. Many restaurants don’t have their own restroom. It’s typically some sort of public toilet shared by multiple restaurants down some weird alleyway or whatever. I don’t like it. But that’s how it is, public toilets even for private businesses. Fine. Snake in the grass – leave alone. I think we can all learn something from that pearl of wisdom. And regarding the bathrooms, blech, but assume you have perfected your squat. Whoa! What is that 150 lashes pale ale?? mmmm!